There were northerly winds over North Atlantic in the months prior to the RMS Titanic leaving port. These winds likely played a role in pushing icebergs farther south than normal and into the Titanic’s path. When the Titanic left port in Queenstown, Ireland on Thursday April 11, 1912, it sailed under brisk winds from the north-northwest at 15-20 knots and a temperature of about 50 degrees. Two days earlier, well to the west in Boston, MA, a few thousand fans shivered in the cold and snow flurries as the Red Sox beat Harvard University 2-0 in the first game ever played at Fenway Park. On April 12 the winds were from the west-southwest at about 15 knots and the noon temperature was about 60 degrees. As the ship continued westward, the skies got cloudier as a weak cold front approached. The noon time temperatures on Saturday April 12 were still around 60 degrees, but another cold front (associated with the previous Fenway snow flurries) was to the west and north of the ship. As the Titanic passed through the second cold front on Sunday April 14, the winds switched to northwest at 20 knots. The noon temperature was around 50 degrees but by 7:30 pm the temperature was 39 degrees. On Sunday, nighttime temperatures dropped below freezing and the skies cleared and the winds calmed. A large Arctic air mass was now over the area, along with a clear, star lite night, subfreezing temperatures and calm winds that resulted in a sea “like glass”. Icebergs where known to be in the region, but the calm winds made spotting them difficult. To spot icebergs during the night, lookouts searched for wind driven wave breaking around their bases. The ship struck an iceberg at 11:40 p.m. on Sunday, April 14. On Monday morning, after the sinking, one survivor reported a breeze that came up around dawn to add to the morning chill. Photographs of the rescue that morning show small waves on the ocean surface, confirming that report. The New York Times reports that new science findings – that of a "cold mirage" – may have played a factor in the sinking of the Titanic 100 years ago this week. Here's the full report. Fifty years ago, not exactly on this day - but certainly during this week - astronaut John Glenn became the first American to orbit the Earth. Alan Shepard had become the first American in space in May of the previous year (and just 23 days after Russian cosmonaut Yuri Gagarin had became the first human in space). But Shepard's suborbital flight was just an up-and-down affair without any circling of the Big Blue Marble. Glenn was shot into orbit on February 20, 1962 aboard the craft, Friendship 7, and took this photo of Florida during one of his three trips around the globe. The entire flight took just under 5 hours. I bet there won't be any superstitious people on this trip. A cruise line is taking bookings for a trip, departing exactly two years from today, to back-track over the route the ill-fated Titanic sailed in 1912. Promotional information for the trip notes that the cruise ship will meet up with a smaller ship equipped with a remotely operated vehicle at the site where Titanic's wreck was discovered in 1985. The remote vehicle will dive to the wreckage to relay live video to passengers. A 12-mile long iceberg which broke off from Antarctica 10 years ago is now closer to Australia than any iceberg has gotten to the continent in over a century. The mega-iceberg is now just a third of its original size and continues to break up into pieces, posing a shipping hazard in the south Pacific. Here is more information, and photos, on the huge berg. No iceberg needed: This drawing from Harpers Weekly in May 1865 showed the wreckage in the aftermath of the explosion aboard the Sultana while it was cruising the Mississippi River near Memphis. It's believed more people died in that accident than aboard the Titanic, which sank in the north Atlantic in 1912.Courtesy Thatcher131Hanging around in the museum lobby yesterday, I came across a cute little exhibit put together by the Mississippi River Visitor Center. And the information is provided just blew me away. Have you ever heard of the Mississippi riverboat the Sultana? I hadn't either, but it's story is a tale of even more tragedy than the sinking of the Titanic. 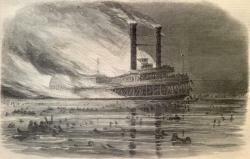 Heading up river on April 27, 1865, with a overflow load of passengers, one of the Sultana's boilers suddenly exploded near Memphis, Tennessee. The ship was carrying mostly Union Army soldiers who had just be released from Confederate prisoner of war camps. It's estimated that up to 1,800 passengers died when the Sultana quickly sank. Slightly more than 1,500 passengers died with the sinking of the Titanic. About 300 to 500 passengers were survivors. Due to the changing course of the river, remains of the Sultana were found in a bean field in Arkansas in 1982 about two miles away from the current path of the Mississippi River. Intrigued? Want to learn more? Read a narrative account of the Sultana here. Thor posted a few days ago about the Discovery Channel show Time Lapse and its use of high-speed cameras to catch super fast stuff and slow it down so it is visible. We recently experimented with the opposite here. The Titanic exhibit has a two-ton piece of the ship's hull on display, and we did a time-lapse video of the installation - seeding up a slow process, the opposite of Thor's post. Check it out. And if you are interested in this kind of stuff, check out the web site for our exhibit Playing With Time which gives visitors the tools to speed up or slow down time to allow us to see stuff that is usually too fast or too slow to perceive.